What is Cuba’s National Dish? Well, that depends on who you ask! 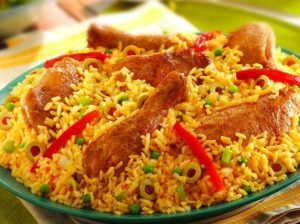 If you ask someone in their 80’s and older, they will remember when Cuba’s Legislature in 1930 declared Chicken and Yellow Rice (Arroz on Pollo) as the National Dish of Cuba. This dish is best made with dark chicken meat which has been seasoned and browned, with the drippings used to saute the next set of vegetables (onions, garlic, bell peppers), adding spices, tomato sauce or paste, chicken boullion, water and rice. The chicken is then re-added, the pot covered until the rice and chicken is cooked. During this last process, chefs can add at the end any of green peas, pimentos, olives or all of the above! However, when you ask younger Cubans, food bloggers, foodies, etc., they all cry Ropa Vieja! as Cuba’s National Dish. This dish, coming from the Canary Islands, has flank beef braising in water for as long as it takes to finally shred it. The added ingredients continue to follow the Cuban cuisine basics: sauteed onions, garlic, bell peppers with spices that include salt, pepper, cumin and a sauce made with tomato sauce/ paste, white wine with added olives. But Cubans in Cuba feel that the food shortage has inadvertently made pork the most popular meat in Cuba. There’s no shortage of recipes here, with the most popular and traditional being Roast Pork, a dish reserved for special occasions and holidays that will be highlighted in our next blog! OFAC Compliant under "Support the Cuban People" Category.